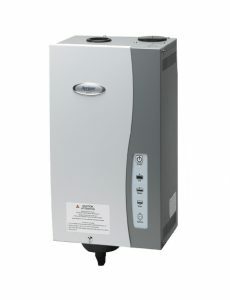 Aprilaire Model 800 Steam Humidifier | Danco Enterprises, Inc. The Aprilaire Model 800 Residential Steam Humidifier features truly automatic control, so there’s no need to manually control the humidifier – though it can be installed in manual mode, if desired. Complementing non-forced air heating sources and other specialty heating systems, the Apirlaire 800 has a capacity of 11.5, 20.5 or 23.3 gallons per day depending on electrical draw and humidifies tightly-constructed homes up to 6,200 square feet. Proven design using electrode technology perfected by Dri-Steem®, a subsidiary of Research Products. Remote or duct mount with no additional accessories. No cleaning or scrubbing. Simply remove the canister and replace it. Steam dispersion technology ensures proper dispersion into the air preventing condensation in ducts. Water filtration is not needed, even in the most difficult conditions. Control, dispersion tube, steam hose and drain tube are included.